GSMArena team, 11 December 2018. The vivo NEX Dual Display Edition teasing is over as the anticipated smartphone was finally unveiled at a special event in Shanghai. And for this flagship, the maker has ditched the motorized popups and instead has solved the notch issue in a different way - with a full-fledged AMOLED screen at the back. Vivo isn't the first one to try the second screen thing, but it might just be the first one to make this work. Because the second Super AMOLED is not just a camera viewfinder, it can be your main screen, too. Or you can use it as a touch panel for gaming, just like on PlayStation Vita and thus remove your on-screen sticks. Or send your WeChat codes there for easier scanning. Among many other things. 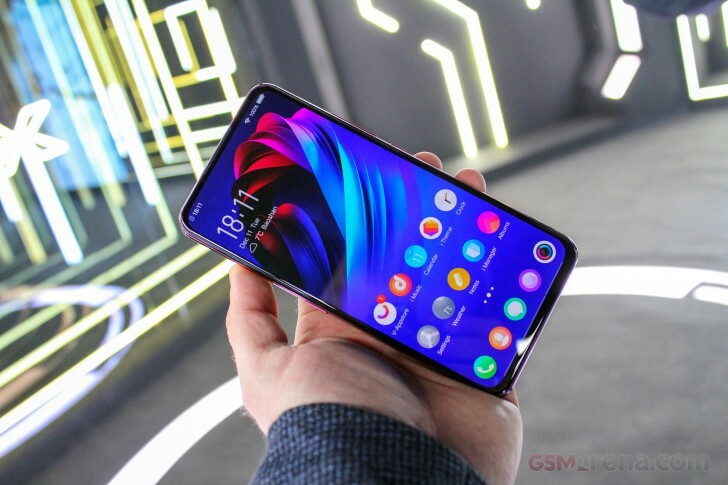 The vivo NEX Dual Display Edition has a 6.39" 1080p Super AMOLED at the front and it is truly bezel-less. There is no notch, chin, cutouts for camera or earpiece. Just screen. On the back is the second screen, a 5.49" 16:9 Super AMOLED, still 1080p. It can be many things, including a viewfinder for selfies. Or it can act as a second viewfinder for your subject(s) to see and adjust their pose by their liking. And the 12MP main camera with dual-pixel AF promises some stunning shots, no matter the occasion. The TOF camera should make the NEX DD a real beast for selfies and portraits - it can make a 3D model of your face and change some of your features with precision in real time. The NEX DD is a flagship not only on the outside, of course. It's powered by the most current Snapdragon 845 chipset coupled with the whopping 10GB of RAM. Vivo is promising dual-turbo management for the RAM, which means better memory utilization for all scenarios. The phone also supports 22.5W fast charging, which is a must for this 3,500 mAh battery if you are to use the NEX with both screens active. 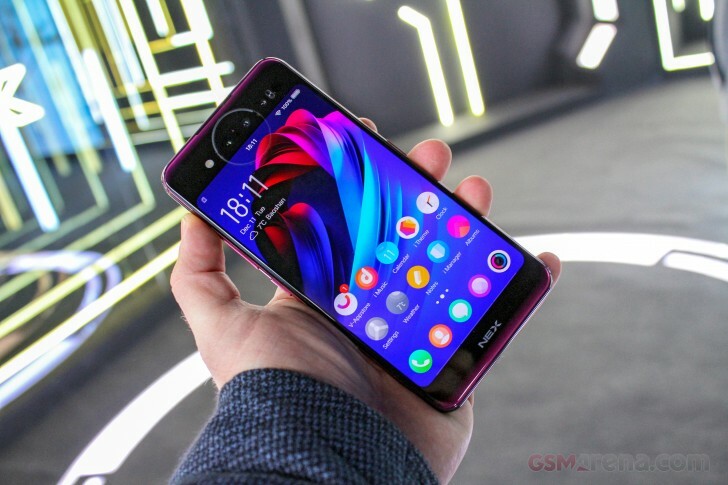 The NEX Dual Display Edition will be launching later this month in China (Dec 29), but more markets should be getting it soon after that. And its specs sheet suggests it might be the flagship many were looking for. 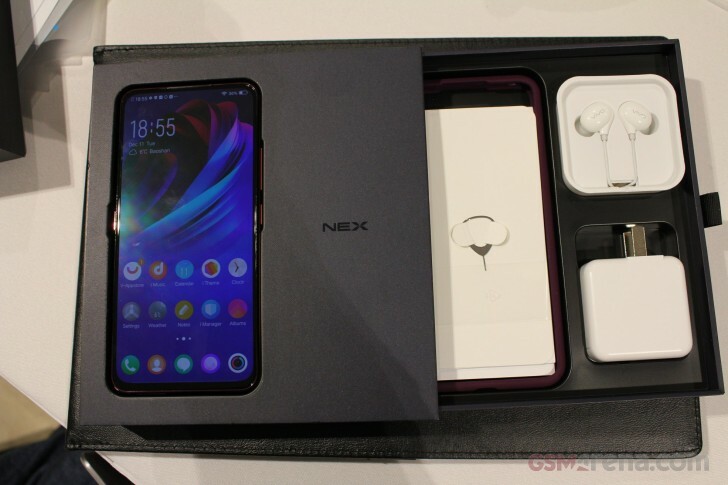 The vivo NEX Dual Display Edition comes packed into a rather large black box. Inside is the phone itself, the proprietary 22.5W charger and a USB-C cable. Vivo has also bundled a very nice-looking in-ear headset. But that's not all. There is also a color-matched bumper case in the box. It is thick enough to keep the screen from brushing the flat surface of a desk or a table and may even keep those screens from cracking if you drop the phone on its edge.